The first thing that we need to get under control when trying to manage weight is blood sugar levels. Yep, that means cutting out sugar in all its forms. Let’s face the facts, sugar is destructive and most people eat far too much of it. And there is no substituting with artificial sweeteners. They will not work either as they can damage your health even more quickly than fructose. It is recommended that you keep your fructose consumption below 25 grams a day. This includes all sources, from beverages to condiments, including the fructose you get from whole fruits. Anyone who is overweight or is dealing with a health challenge should keep these levels at 10-15 grams per day. The easiest and quickest way to dramatically reduce your fructose consumption is to cut out all sweetened drinks, including juices and processed foods of all kinds. Cane sugar, honey, date sugar, coconut sugar, brown rice syrup, fruit juice, molasses, maple syrup, sucanat, sorghum, turbinado or agave syrup will not reduce any of the risks as they too contain high amounts of fructose. Agave is most likely the worst offender of the bunch as it can reach as high as ninety percent fructose. Even if you cut your fructose levels to no more than 25 grams per day you are guaranteed to get more anyway as it is easy to consume ‘hidden’ sources of fructose during your day especially if you drink beverages other than water and eat any processed food. You can forget drinking any type of regular soda…just one 12 ounce can of this poison contains 8-10 teaspoons of sugar to say nothing of the calories with no nutritional value whatsoever. What most people don’t realize is that 15 grams of fructose is not very much. One apple or one banana can exceed that daily amount. Studies reveal that fructose when consumed in quantities over 25 grams per day will rapidly accelerate aging, degenerative disease and of course becoming and staying over-weight. Not a pretty situation and one most of us don’t want to find ourselves in. No one says it’s going to be easy…especially at first, but there are plenty of tools and strategies available to make this transition as ‘painless’ as possible. You must slowly squeeze out the ‘not so good’ habits and foods and replace them with better habits and choices – ones that support and build health rather than stealing it away. You must rethink your position on sugar and understand its devastating effects on your body. Try treating it as an illicit drug…a dark force that must be avoided at all costs. Make it the villain that is is in your mind. 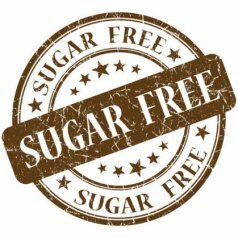 Sugar plays a pivotal role in the destruction of a healthy, vibrant, radiant body and is quietly lurking behind the devastating illnesses we fear the most; heart disease, cancer, diabetes and Alzheimer’s. Sugar causes cravings, binge eating, and weight gain, it’s that simple. It has also been linked to depression, poor eyesight, migraines, gout, and osteoporosis. For those trying to lose that excess weight, losing the sugar from your diet will kick start kissing the pounds good-bye and give you the motivation needed to stick to it. Giving up sugar is one thing you’ll be thanking yourself for over and over. The positive effects show up in your body and your mind. If you struggle to lose those extra pounds, if they seem as though they are glued onto your body then you are most likely experiencing “weight loss resistance”. Everything you need to know and do to rid yourself of this resistance is contained in my new product “Stop Weight Loss Resistance”.